← Cosplay by McCalls Wayfaress M2085 and Thirst M2090. 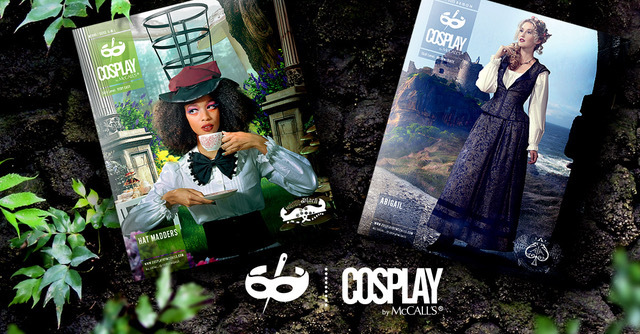 As McCalls patterns continues to develop their cosplay pattern line, their decisions about what to include in their exclusive set of specialty patterns continues to be a delight. “Abigail” M2089 (6-14 and 14-22) and “Hat Madders” M2093 (S-M-L all in one envelope) certainly keep us interested. This is their “let’s build skills” pattern release. The pieces are very simple, and the sewing is very straightforward, with no difficult assembly procedures. There are no sleeves to set and no boning for which to sew channels. 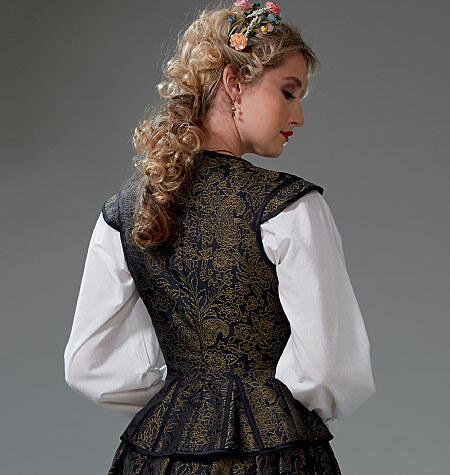 The blouse is not included (the blouse in the envelope photo is from their Vault Collection M2055). 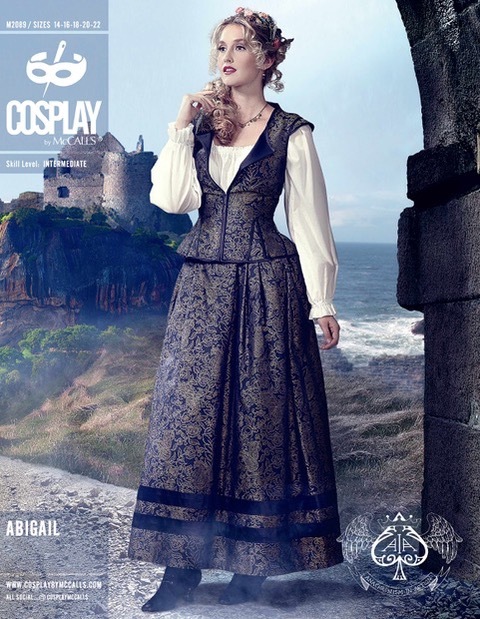 Those who feel intimidated by intermediate level patterns might want to try this one to gain confidence, as it looks to me like the rating is not so much about skill level as it is about number of steps needed to compete the pieces, and the wrangling of the pleats. Just take your time with that. Slow and steady is actually faster in these cases. 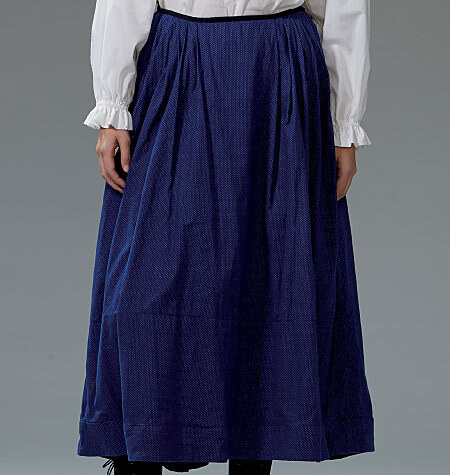 You can also leave off the skirt trim to make the assembly easier if it stresses you. 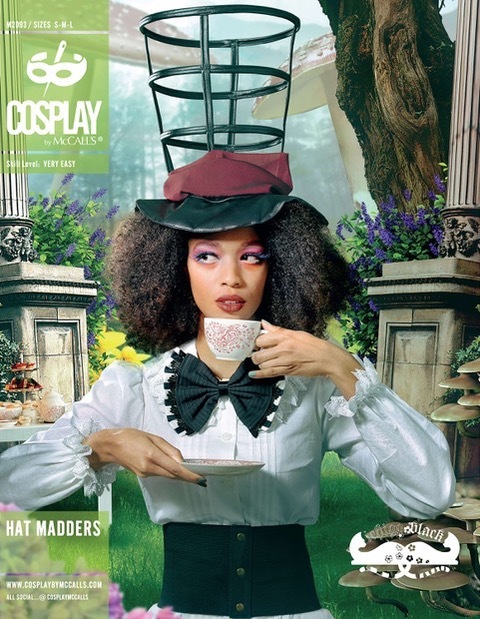 For our other pattern in this release, we see Ichigo Black is back again with more of her eclectic fun.“Hat Madders” M2093 is a set of easy accessories that will launch the beginning sewer. I can’t think of a better starter pattern for budding costumers. It’s an inexpensive pattern—a plus for the novice. 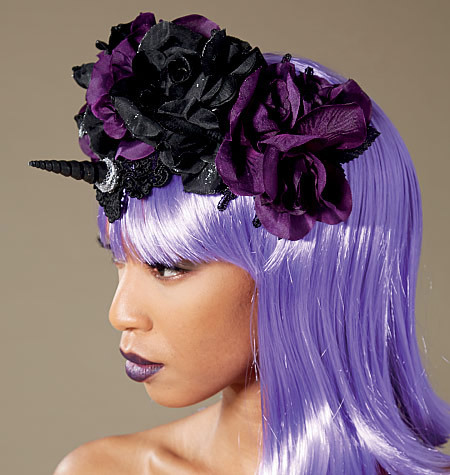 It has a tie-on choker and cuffs to embellish, a kooky oversized bow tie, a fun cage-like top hat made with boning (I so want to make one and put a bird in there), and an easy unicorn headpiece made with purchased shells and flowers. The only change I’d make to this pattern is to suggest a very firm interfacing for the hat brim so it can better support its own weight. The pattern pieces here are small, and easy to handle for younger hands. It does not really matter if your seams are straight or if too much or too little seam is taken. Monetary and time investment is low. This is the perfect set up for throwing out any cares about the cost of the fabric and trim, and setting creativity free. This is a great pattern for using up scraps, lucky finds, and thrift store treasures. There is no wrong way to approach these pieces. The pattern tutorial urges you to think outside the box when sourcing trims and accessories, and to find new uses for things, as this is the heart and soul of a costumer. This pattern successfully nurtures this skill, and sets the costumer up for success, bolstering self confidence for future, more complicated projects.